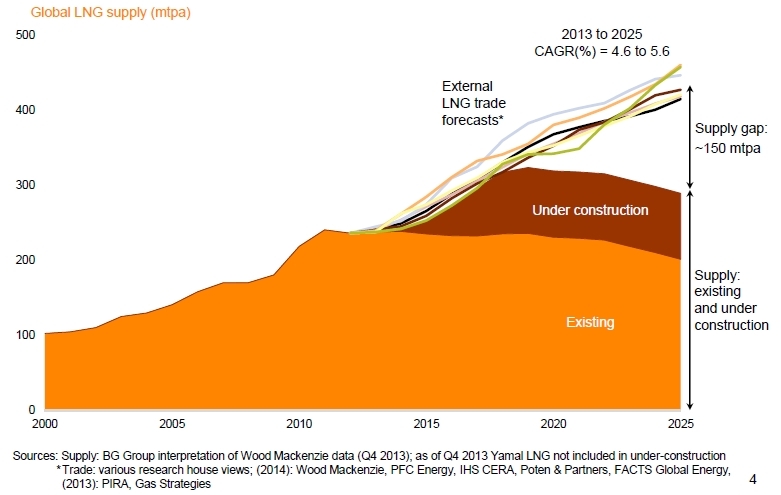 A market consensus view has developed that the global LNG market will remain tight for the rest of this decade. The thesis runs that LNG buyers are nervous about being caught short supply as gas import demand from developing economies surges, while producers are also projecting a tight market to support their liquefaction investment cases. While this consensus is currently supported by a range of buyers and producers, it is increasingly coming under challenge. A market consensus view has developed that the global LNG market will remain tight for the rest of this decade. The thesis runs that LNG buyers are nervous about being caught short supply as gas import demand from developing economies surges. The post-Fukushima squeeze is fresh in mind. Producers are also projecting a tight market to support their investment cases, given the tens of billions of dollars flowing into new liquefaction capacity. While this consensus is currently supported by a range of buyers and producers, it is increasingly coming under challenge. The tight market consensus has developed with some justification. Since the Fukushima disaster and the end of the most recent liquefaction growth ramp in 2011, new supply has struggled to keep up with demand growth. 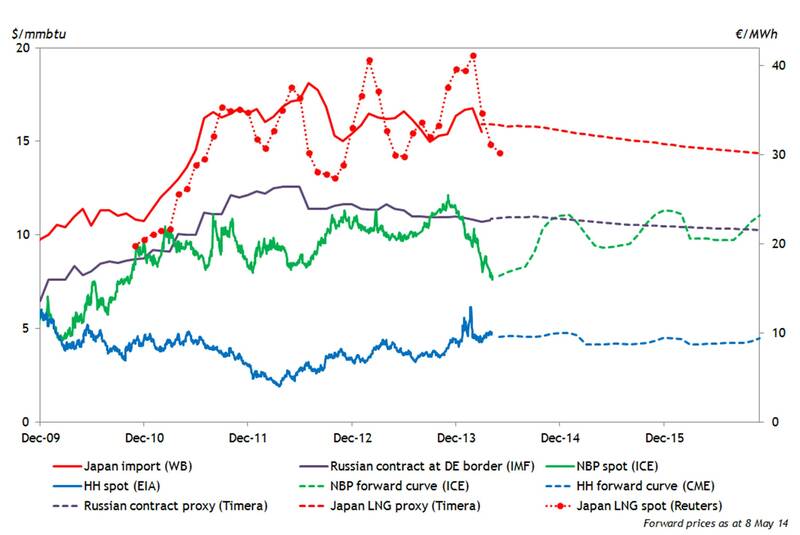 This has driven a structural premium of Asian spot LNG prices over European prices as shown in Chart 1. It is not difficult to build a compelling case for market tightness to continue as new production is absorbed by aggressive demand growth across Asia, the Middle East and South America. However a number of key factors driving the global LNG supply and demand balance remain uncertain. In our view that uncertainty warrants the consideration of alternative outcomes. Complexity and uncertainty around the global supply and demand balance increases significantly from 2015. Most forecasts of the LNG market balance show a steady growth in demand met by an equally steady increase in supply (see Chart 2 below where BG has overlaid a number of consultant demand forecasts on its estimates of supply growth). But the actual outcome, whatever form it takes, may not follow such a smooth path. On the supply side, large and lumpy volumes of new liquefaction capacity are being developed. As these projects approach FID, much of the gas will have been signed under long term contract. But many of these supply contracts are with portfolio players rather than the gas being assigned to dedicated demand sources. Western Canadian projects also seeking to enter the LNG supply business. History illustrates the timing risks associated with large new liquefaction projects. New capacity has consistently faced delays given the cost and complexity of project execution. This is rightly presented as an argument in support of tighter market conditions. But it can also result in large volumes of gas coming to market at a similar time (i.e. divergence of actual vs forecast delivery profile). These volumes can place downward pressure on spot prices even if only on a temporary basis. There is also the potential for a major new ‘wave’ of supply in the 2018 to 2023 time window (encouraged by the current tight market price levels). There is clearly significant uncertainty around the magnitude and timing of this new supply. But once projects are committed, it can be difficult for the industry to respond to developments in market dynamics, given the lengthy (~4 year) liquefaction construction period. On the demand side, Japan has recently announced its decision to re-start its fleet of nuclear power plant, although the extent and timing of the resulting LNG demand displacement is unclear. But the elephant in the room is non-Japanese Asian demand. The strong LNG demand growth projections (shown in Chart 2) are heavily dependent on growth in Chinese and Indian demand. However uncertainty over the size and impact of a more sustained slowdown in Asian economic growth remains. China epitomises this problem. Between recent IEA and Chinese forecasts the uncertainty for 2020 gas demand ranges from 330 to 400 bcma. The domestic supply situation is unclear and partially driven by views of future shale gas success. The possible use of upside to 65 bcma in Turkmenistan and Central Asian pipeline imports is perhaps eclipsed in uncertainty level by the ‘Schrödinger’s Cat’ of the deal for Eastern Siberian gas, reported as a 38 bcma deal but with the potential for higher volumes over time . If China’s LNG imports are the ‘residual’ balancing item in the global market then they reflect a highly uncertain future. There can be no doubt that the LNG market is currently tight. There has been little in the way of new liquefaction capacity since 2011 and there have been significant feedgas issues into some existing terminals (e.g. Algeria, Eygpt and others). This has contributed to the spot price volatility that can be seen since 2011 in Chart 1, although it should be recognised that this volatility is in part driven by the relatively small number of price-disclosed spot sales. Over the same period Asian demand growth has remained robust (albeit with seasonal variations) and incremental demand has largely been satisfied via the diversion and reloading of European cargoes. These dynamics are illustrated in Chart 3. If Asian LNG demand growth continues to outstrip its dedicated supply for the rest of the decade, European LNG supply will likely retain its current global balancing role. In other words significant spot price premiums over European hub prices will attract cargoes away from Europe, to be replaced as necessary by ‘back-filling’ Russian pipeline supplies. Spot price volatility will likely remain, as the marginal drivers of LNG arbitrage dynamics change over time e.g. due to seasonal factors and timing of new supply. So there may be temporary increases in cargo flows to Europe as the global balancing market in times of lower Asian spot prices (with Russian pipeline supplies to Europe providing the buffering mechanism). Under these conditions of market tightness, oil-indexed contract pricing is more likely to remain dominant, albeit accepted with extreme reluctance by Asian buyers. The LRMC of new projects in Australia, Canada and East Africa will be an important benchmark when long term contracts are signed. In other words it is likely to be a seller’s market where Australian and North American export volumes are absorbed without a structural impact on market and contract pricing. In this world the majority of US exports will flow to Asia. However the more flexible structure of US export contracts will likely increase the influence of Henry Hub on LNG spot market price dynamics. US export projects represent the reconnection of the US to the rest of the global gas market and a Henry Hub/NBP driven ‘Atlantic Basin’ price signal is likely to increase over time. However, underpinning this view of a long-term tight LNG market is the premise that ‘Economics 101 has failed’ in that suppliers, although each hopeful of supplying what they see as a premium market, collectively fail to execute projects to schedule and so in aggregate constrain supply. There are a number of factors that could derail the consensus view. But perhaps the most obvious one is a failure of developing economy demand to materialise to the extent that has been forecast. This could be for example due to an Asian economic downturn (major setbacks in emerging economies are common even if only temporary). Or it could be due to a combination of Japanese nuclear restarts and the displacement of large volumes of Chinese LNG demand by Russian pipeline imports or other supplies from the back end of this decade. 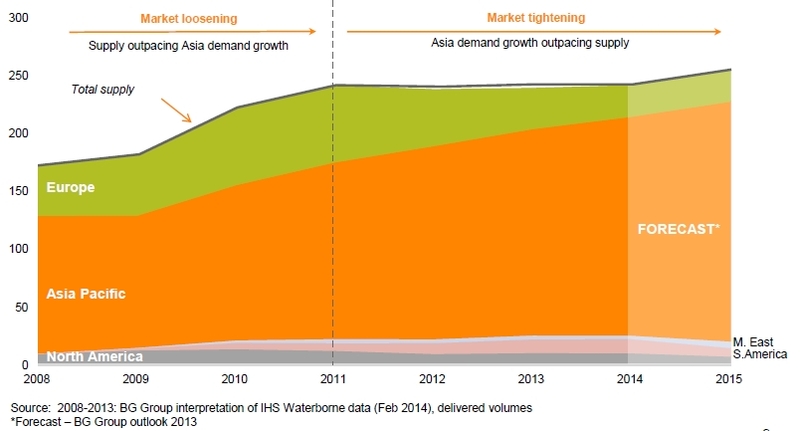 Howard Rogers explored some of the drivers of an Asian LNG demand induced oversupply situation in a previous article. Whatever the potential causes, the result of an oversupply situation is likely to be the flow of surplus gas into the LNG spot market. This will place pressure on global LNG prices to re-converge as they did in 2009-10. It would also tend to dampen LNG spot price volatility and could significantly reduce the value of LNG portfolio flexibility (which is currently at a premium). LNG volumes ‘in excess’ of Asian requirement would find a home in Europe (as they did in 2010 and 2011) placing pressure on Russia to either reduce pipeline supplies to maintain hub prices at ‘target’ levels or alternatively engage in a price war to reduce US LNG exports. Such dynamics, in addition to seasonal weather effects could increase price volatility albeit around lower LNG price levels. This is unlikely to be a good outcome for LNG producers and large portfolio players and unsurprisingly some larger players are starting to downplay the risks around an oversupply scenario (perhaps a barometer for concern). Such an oversupply scenario may be relatively short lived (e.g. the period over 2009-10) as a result of a temporary mismatch in new demand and supply. But this could be enough to disrupt long term contract pricing dynamics and to shift the balance in favour of LNG buyers. The 2009-10 period was an important driver of the development of hub prices in Europe. A similar oversupply situation later this decade could be the catalyst for an increase in influence of hub pricing on Asian LNG supply. It is interesting to note that anecdotal references to ‘hybrid pricing’ i.e. the inclusion of hub price as well as oil indexation, are starting to circulate in Asian LNG circles. In this article we have set out two views of LNG market evolution. The current consensus view that market tightness continues until the end of this decade, and an alternative view that there is another period of global oversupply (either on a temporary or more structural basis). The actual outcome may indeed differ from both of these. But in our view the level of uncertainty around some of the key drivers of supply and demand warrants the consideration of a range of outcomes. The value of considering alternative outcomes comes from a realisation that LNG asset and portfolio values may differ substantially depending on the evolution of the global market balance into the end of this decade. Spot price dynamics, gas flows, the structure of supply contract pricing and the value of portfolio flexibility will all be strongly influenced by market outcome. We take a more structured look at the commercial implications of a tight vs oversupplied market in an article to follow shortly. This week’s article was co-authored by Howard Rogers, a Senior Advisor with Timera Energy and Director of Natural Gas Research at the Oxford Institute for Energy Studies.